We've been using ElectroMotion® ESL speakers here at Crutchfield for a few years now. 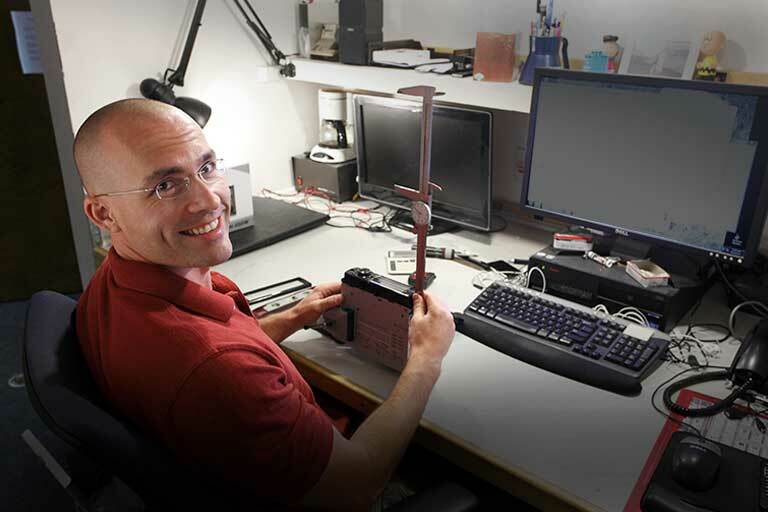 We've been using ElectroMotion® ESL speakers here at Crutchfield for a few years now. Their unique design and incredible sound quality are perfect for many home audio demos and trainings that we do. 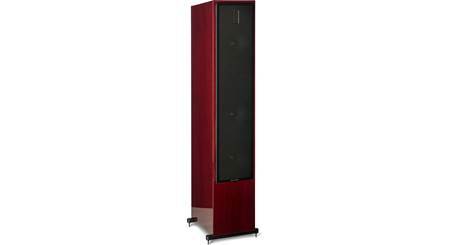 So I was excited when MartinLogan unveiled their new flagship speaker in this renowned series — the ESL X. It features some notable upgrades over the ESL that add up to a big boost in performance. A larger electrostatic panel delivers better midrange and high-frequency presentation. And the addition of a second 8" woofer to the back of the integrated bass-reflex enclosure provides even more powerful low-frequency impact. Add great looks and incredible sound to your room with a pair of ESL X speakers. 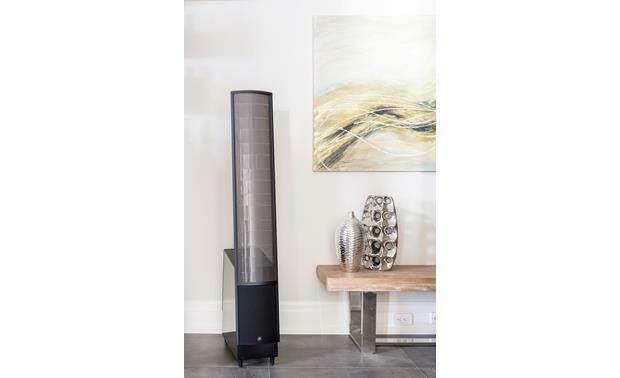 MartinLogan paid careful attention to providing the purest audio experience available. Instead of domes and cones, this speaker uses an electrostatic panel to reproduce treble and midrange. It's an ultra-thin diaphragm that's suspended between two electrically charged perforated steel plates. The diaphragm's light weight allows it to move back and forth between the plates thousands of times a second, creating incredibly detailed, lifelike sound. The electrostatic panel handles all of the midrange and high-frequency sound production, while the dual 8" subwoofers provide tight, clean bass. Controlling a speaker's sound dispersion is important — you don't want reflective sound bouncing off the walls to reduce the accuracy of your music. The ESL X's dipole design avoids this common problem by producing sound from both the front and back of the speaker in opposite phase. Sound waves that meet on the edges of the speaker are cancelled out, so there's no reflection from the side walls that can muddy detail and stereo imaging. 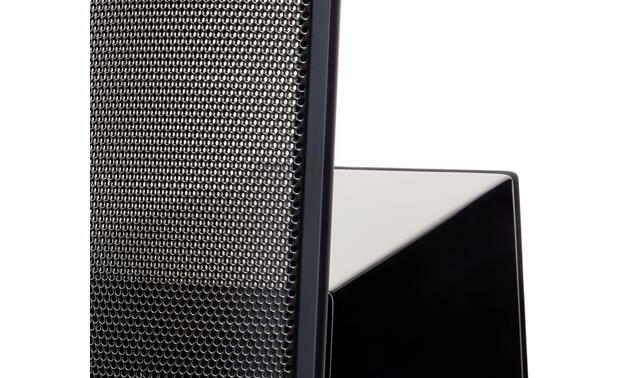 MartinLogan made sure no stone was left unturned when designing the ESL X. It's been maximized to deliver the best sound with the smallest footprint. A down-firing port reinforces bass response while maintaining accuracy and efficiency. Two sets of custom 5-way binding posts allow for bi-amping or bi-wiring. Adjustable floor spikes with removable protective covers are included to provide flexible placement options. Love the new sound, even with my little Yamaha S501. Still playing with placement, but have a nice wide soundstage with definitive imaging. Depth of soundstage is not as good as it could be, but probably more of an amp problem than speaker issue. Super cool look though. 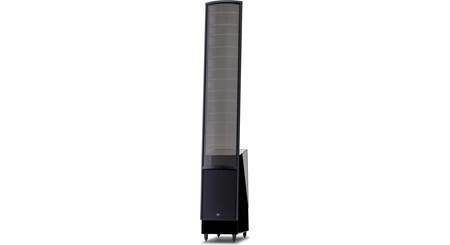 Hybrid Electrostatic Speaker: The MartinLogan ElectroMotion ESL X is a hybrid electrostatic loudspeaker that features a XStat CLS electrostatic transducer panel, an optimized Vojtko crossover, and two passive 8" woofers. Electrostatic panels are perfect for reproducing high, midrange, and midbass frequencies. However, both the size and the power requirements of deep bass frequencies are best served by traditional cone woofers. A phase and amplitude optimized Vojtko crossover (400Hz) ensures a seamless transition between the two sound reproduction philosophies. As a result, this speaker offers the best performance for high, mid, and low frequencies. 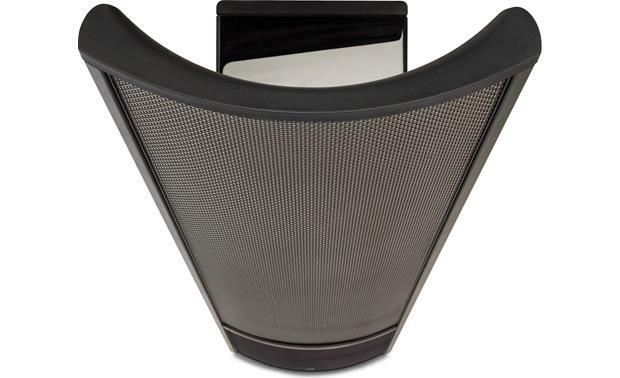 XStat CLS Transducer: The MartinLogan ElectroMotion ESL X features a 8.6" (w) x 40" (h) XStat CLS Transducer. This new XStat transducer builds upon the legacy of MartinLogan's electrostatic heritage with the incorporation of a myriad of technology and design innovations including CLS, MicroPerf, Generation 2 Diaphragms, ClearSpars, Vacuum Bonding, and AirFrame technology. Through rigorous testing, this curvilinear electrostatic panel has proven itself to be one of the most durable and reliable transducers available today. Fabricated from a custom tool punched high-grade steel, the patented panel is then coated with a special polymer that is applied via a proprietary electrostatic bonding process. This panel assembly houses a membrane just 0.0005" thick. Ruggedly constructed and insulated, the panel is rated to easily handle 20 to 300 watts of power. Generation 2 Diaphragm: The diaphragm used in the ElectroMotion ESL X XStat transducer employs an extremely sophisticated conductive coating applied to the polymer surface at an atomic level using a plasma bonding process. A proprietary compound is driven into the surface of the polymer film in an oxygen free argon chamber. This process allows extremely uniform surface resistivity characteristics, an optically transparent surface, and a nearly massless diaphragm. This uniform surface resistivity controls the electrostatic charge on the diaphragm surface and regulates its movement. Controlled Dispersion Sound Radiation: A key attribute of the ElectroMotion ESL X is its naturally dipolar radiation pattern. A true dipole, the EM-ESL X radiates sound with equal intensity from the front and back of its diaphragm, but the outputs are in opposite phase. As a result, sound waves rippling out toward the sides meet at the speaker's edge and cancel. That and the relatively large size of the ElectroMotion ESL X's electrostatic panel cause output at the sides to be very low relative to that of a conventional loudspeaker, which in turn minimizes side-wall reflections that tend to muddle sonic detail and stereo imaging. While the reduction in output to the sides contributes to the astonishing clarity, the energy reflected off the wall behind the speaker opens up and deepens the sound. 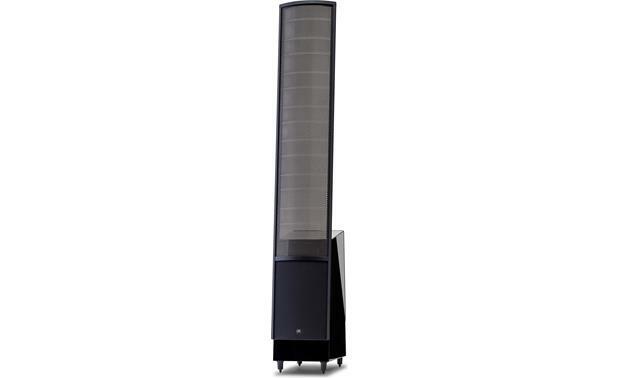 Full-Range Operation: Another significant advantage of MartinLogan's exclusive electrostatic transducer technology is that no crossover networks are used above 400Hz, because they are not needed. The ElectroMotion ESL X consists of a single, seamless electrostatic membrane reproducing all frequencies above 400Hz simultaneously. This eliminates the crossover phase aberrations that are associated with traditional tweeter, midrange, and woofer systems. The result is a dramatic improvement in imaging and staging performance. Dual 8" Woofers w/ Ported Cabinet: Two precise 8" high-excursion, perfectly balanced, audiophile grade, doped-fiber cone woofers have been custom designed exclusively for The EM-ESL X by MartinLogan's in-house engineering team. These woofers precisely optimize cone suspension and magnetic flux field to produce high levels of bass output and simultaneous precise midrange. The custom woofers' rigid light-weight diaphragm eliminates cone flexure and maximizes response time to achieve remarkably low-distortion. The 8" woofers are housed in a non-resonant asymmetrical cabinet with a down-firing bass port for additional bass extension. Note: When you first begin to play the ElectroMotion ESL X speaker, it will sound a bit bass shy. This is due to the high-quality, long-life components used in the passive woofer. The custom-made woofer requires approximately 72 hours of break-in at 90 dB (moderate listening levels) before any critical listening. The break-in requirements of the crossover components (and, to a lesser degree, the stator) are equivalent. Proprietary Vojtko Filtering: To seamlessly blend audio output from the high- and mid-frequency electrostatic panel to the low-frequency woofers the ElectroMotion ESL X features a proprietary Vojtko topology filter utilizing custom air core coil and low DCR steel laminate inductors, polyester film capacitors in series, and low DF electrolytic capacitors in parallel. Bi-Wirable Binding Post: The ESL X features bi-wirable binding posts and provide the ultimate level of flexibility for connection and setup. 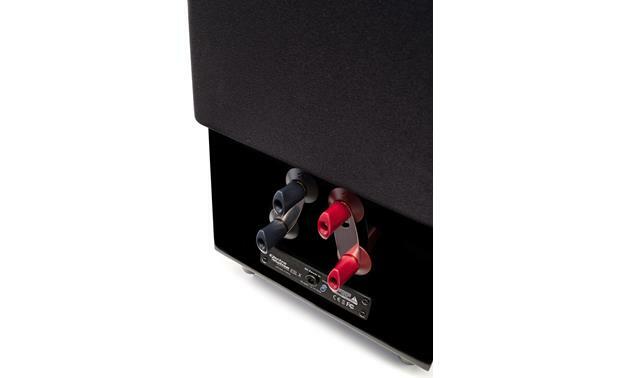 MartinLogan's proprietary tool-less binding posts simplify cable connection and management. Two sets are supplied; one connected to the electrostatic panel and the other feeding the woofer. You can choose to bi-amp the ESL X, or use jumper clips between the binding post sets for a single wire-connection. The binding posts will accept bare wire (16- to 8-gauge), pin-connectors, spade-connectors, and banana plugs (single only). Low-Voltage DC Power Supply: The ElectroMotion ESL X speaker uses an external low-voltage power supply to energize its electrostatic panel. The included power supply firmly inserts into the "DC Power In" receptacle on the rear-panel of the speaker and then to an AC wall outlet. The ElectroMotion ESL X speaker features a signal sensing circuit which will switch the ElectroMotion ESL X off after a few minutes of no music signal, and requires less than two seconds to recharge the panels when a music signal is present. 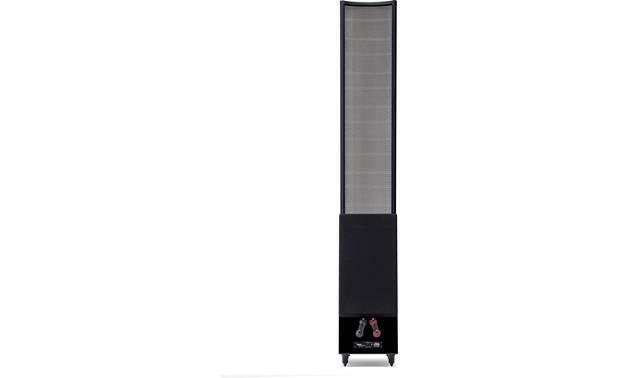 Applications: The MartinLogan ElectroMotion ESL X floor-standing speakers can be used as stereo speakers or home theater front/surround speakers. 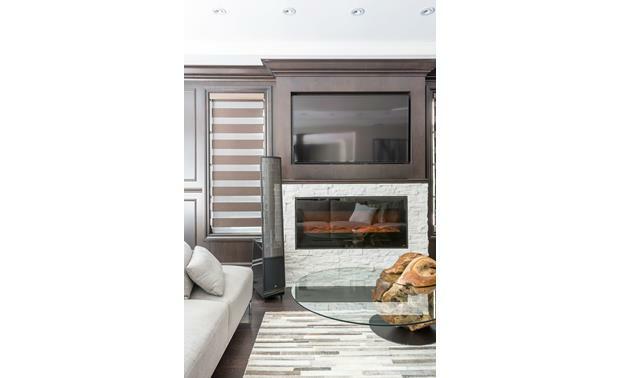 The ElectroMotion ESL X speakers are ideal for medium and small rooms. 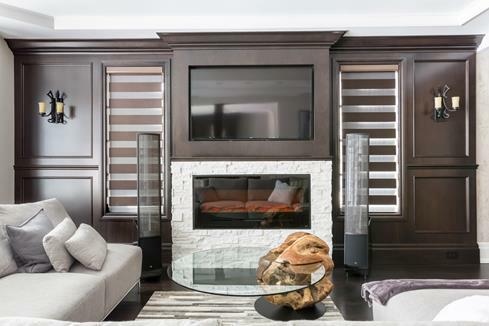 Placement: The ElectroMotion ESL X speaker should be placed approximately 2' to 3' from the front wall (the wall in front of the listening position) and about 2' from the side walls. Your sitting distance should be further than the distance between the ElectroMotion ESL X speakers themselves. This will allow you to attain good center imaging and stage width. Generally, it is found that the ideal listening position is with the speakers slightly toed-in so that you are listening to the inner third of the curved transducer section. 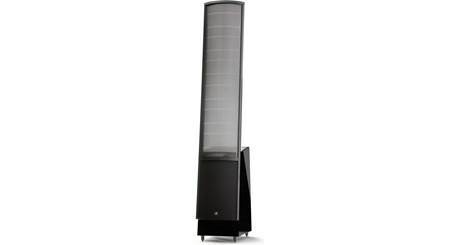 Interchangeable Feet: The MartinLogan ESL X floor-standing loudspeaker includes four pre-installed rubber feet for tile and hardwood floors. You can remove the rubber tip from the pre-installed feet to reveal four metal spiked feet for carpeted flooring. 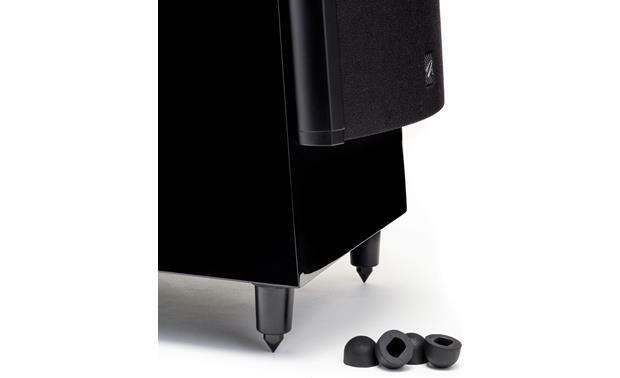 The feet are threaded into the base of the speaker and can be adjusted to non-level surfaces. What happened to the free ML subwoofer when you buy two Electrostatic Speakers? 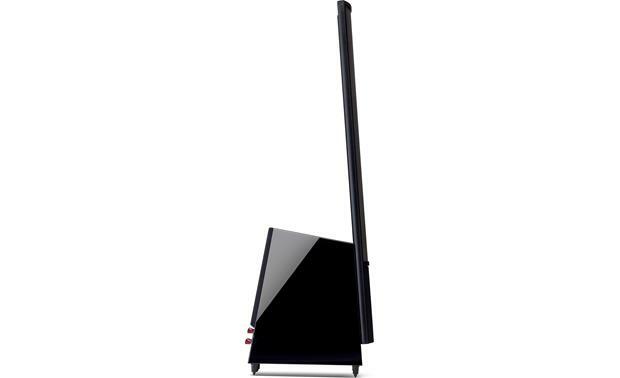 Searches related to the MartinLogan ElectroMotion® ESL X Floor-standing speaker.